By now most of you will have heard the story breaking across the blogosphere over the weekend (and which shows no sign of dissipating) concerning an Anglican priest’s attempt to silence a blogger critic. The priest is Stephen Sizer, a vocal opponent of Christian Zionists (and indeed anyone who mildly suggests the Jews remain God’s chosen people), he vociferously opposes Israel and lends rather uncritical and slavish support to the Palestinian nationalist cause. It was always inevitable, then, that the blog Seismic Shock, set up with the express purpose of highlighting and identifying anti-Zionism, anti-Israelism, even anti-Semitism within the Church, should focus on Sizer’s theology and activities, including appearing on Iranian television to discuss Christian Zionism, speak at Muslim centres and Palestinian solidarity events, and rather unwisely share platforms with people who, for example, condone suicide bombings. “So what?” I hear some people say. “He can do what he likes, can’t he? This is, after all, a free country, and however unreasonable someone’s views are, or ill-advised they may be in how they choose to promote them, what’s to stop him?” Actually, I wholeheartedly agree, couldn’t agree more in fact. Not that I agree with Sizer’s views, by a long shot. Having reviewed his first book for a scholarly journal (and currently reviewing his sequel), I find Sizer’s theology unpersuasive, overtly polemical and unnecessarily pejorative (and thus not particularly constructive or helpful). Meanwhile, a tendency to build straw men and parody his opponents suggests methodology takes somewhat of a back seat. More’s the pity really, because aspects of extreme Christian Zionism do need to be challenged, and I believe that had he set about his crusade (and make no mistake, it is a crusade) with a greater degree of charity towards those Christian brethren he disagrees with, he would likely have won some of their support, helping a number of Christians to be more objective and realistic in their support for Israel. Instead, his brusque and abrupt manner has merely served to polarise the Church unnecessarily. However, leaving aside the manner in which he has gone about expressing his views (to the detriment of Christian unity), nonetheless Sizer has every right to express those views as he pleases. Likewise, given how and where he has chosen to express them, he must be prepared for and expect his foes to react and respond equally forcefully and brusquely. Seismic is one such critic, and while I have not read all his posts those I have seen seem to substantiate his criticisms and reports of Sizer's activities. I do not suggest every response to Sizer has been necessarily expressed in a spirit of Christian gentleness, though this is not surprising given how his views have attracted the ire of all manner of people – Christian and non-Christian alike – from across the political spectrum. Sizer has no control whatsoever over how his views are cited by Holocaust deniers and far-right white supremacist groups, but that they do so with regularity is troubling to many and at the very least indicative of his tone and style. Meanwhile, if one chooses to disseminate views through the blogosphere (as Sizer has done), then quite frankly you must be prepared for others to respond robustly via the same medium. In short, if you engage in public theology, and do so publicly, then you’d better be prepared to be challenged and defend your views publicly. You would expect someone of Sizer’s educational background to understand and accept this. But instead Sizer, already known for being a rather prickly character towards those taking issue with his views, together with Anthony McRoy (a lecturer at a UK theological college), made a complaint to the police about Seismic’s activity, resulting in his IP address being traced and the local bobbies paying a visit (in a strictly “informal” capacity, you understand) and putting pressure on the blogger, a young Messianic believer and ex-student of Leeds University, to delete one of his blogs. Somewhat alarmed, Seismic agreed. Ironically for both complainants, history caches of deleted websites remain in cyberspace for perpetuity. Thus, all this clumsy attempt at censorship has achieved is the so-called Streisand Effect, whereby censorship achieves the complete opposite and a far greater number of people than ever will view the material Sizer and McRoy sought to have removed from the Internet. It is not clear whether he expected Vee to publish the comment (the tone rather suggests not, that the tone was such she wouldn't dare), but she did anyway. Meanwhile, these two attempts at censorship quickly came to light and caused outrage across the blogosphere. I am rather convinced Sizer couldn’t have miscalculated more had he tried (signing off with the word “Blessings”, which was picked up by nearly blogger, certainly did him no favours). Any attempt at silencing critics or limiting free speech is red to a bull as far as bloggers (and in fact most people) are concerned. To do so once might be perceived as a foolish error, but twice is downright carelessness. The result has been a story which has spread from blog to blog (it has appeared on literally dozens upon dozens of sites), quickly working its way up through the larger blogs with substantial readerships, and thence propelling upwards to nationwide mainstream media websites such as the Spectator, the BBC, and the Jewish Chronicle (and I suspect it won't end there). Even West Yorkshire Police issued a terse statement when pressed for more detail. Worse for Sizer and McRoy, it is highly significant that the critics of their actions come from Christians and non-Christians alike, as well as commentators and blogs on both the political left and right, all united in anger at this effort to censor a critic. Alluding to the end of the film Spartacus, one blogger has even taken up the motto, “I’m Seismic Shock” which has electrified the blogging community and been taken up with great gusto. (I'm waiting for the inevitable Youtube clip, with Kirk Douglas stepping forward to say, “I’m Seismic Shock”, with his friends stepping forward to do likewise.) Worse for both complainants, they appear to have achieved the complete opposite of what they intended, and I am beginning to feel rather sorry for these chaps because I rather think they're going to face more criticism than ever, with bolshy bloggers everywhere out to test the very boundaries of free speech. And neither will it end there, I suspect, because the issue goes to heart of a debate already taking place in this country concerning diminishing freedoms and police powers. People are already asking why the police became involved in what appears to be a civil issue. Is criticism of someone’s views a crime? Can it really be considered harassment? Also, did this issue progress through the police’s proper complaints chain, and on what basis? Meanwhile, given how Sizer has blogged about his involvement and relationship with the police, I wouldn't be surprised if at some stage someone will want to know if this has had any bearing at all on how the complaint was handled. For his part, one wonders why Sizer is not prepared to take on his critics in the very arena he has himself entered and subsequently been challenged – the blogosphere – or else simply ignore the issue, which is what politicians, academics and others debating in the public square do on a daily basis. One thing is certain: this sorry state of affairs offers the Church valuable lessons when it comes to debating publicly theological issues. If you are going to take a polemical stand on something, then you must be prepared to take whatever’s thrown back at you. The alternative is to avoid unnecessarily pejorative language and Christian disunity by expressing views in a collegial and respectful spirit. Scholars who disagree with each other strongly nonetheless manage to engage in respectful dialogue all over the world every day in a variety of arenas. On the other hand, pejoratively taking on those you disagree with will often result in a similarly expressed reaction. I may disagree with some dispensationalists or Reformed Christians on some issues, but they remain my Christian brothers and sisters, and while we have the right to discuss, debate and oppose theological views we disagree with, there is a proper way of doing it - even robustly - and quite another which is unprofitable and merely serves to polarise the debate. In short, there is little substitute for academic, objective argument, while polemics and straw man building either illustrate weak arguments or insincere motives. It is also important to note that as Christians we will be judged by the people we keep company and who we ally ourselves with. Too often, I think we consider our theological views so important that we at times allows ourselves to be compromised by allying ourselves with people or institutions we mistakenly believe will forward those views, but which merely serve to bring them into disrepute.Thus, to Christians of all sides I would say the world is watching how we hold our debates. STOP PRESS: As I get ready to hit "publish" this story just made the Guardian website. Original story concerning Seismic Shock, Vee and Sizer on Saturday, here and here. Extensive list of sites running this story, listed here and here. Take my poll on Christian responses to the State of Israel. See top-right of this page. POLL ENDS TOMORROW. The only reason I can think why the Police might be involved is if the false accusation of 'anti-semitism' might place one in physical danger of attack. Perhaps Stephen Sizer feels there is a dishonest campaign against him that is politically motivated and he feels threatened by it. Why has this response against arisen now I wonder? We know this from Haaretz 19/01/09http://www.haaretz.com/hasen/spages/1056648.html">"Israel recruits 'army of bloggers' to combat anti-Zionist Web sites" at a time when Gaza was being bombed heavily. Personally speaking as a charismatic Christian, we need to be engaged in prophetic ministries that speak the word of God into situations, and not be engaged so heavily in politics - from both sides. We should instead be peace makers who highlight injustice and appeal for righteousness in government. I fail to see though how Christian Zionists can criticise Sizer for those he meets with when some Christian Zionists meet with Israeli minsters who threaten holocausts against Palestinians. The UN may yet declare aspects of the Gaza campaign a war crime. Christians who lack sympathy for the Gazans should examine their consciences, and on the other side we should speak against Hamas rockets. My concern is that Christians should learn to love their enemies and not demonise people, whether, Jews, Palestinians or Muslims etc. Yes as Christians we should be careful who we meet, but sometimes dialogue is a way of helping people out of entrenched positions. "...when some Christian Zionists meet with Israeli minsters who threaten holocausts against Palestinians." "We know this from Haaretz 19/01/09http://www.haaretz.com/hasen/spages/1056648.html">"Israel recruits 'army of bloggers' to combat anti-Zionist Web sites" at a time when Gaza was being bombed heavily." Take a look at the bloggers denouncing this - left and right, Zionists and anti-Zionist, so it's far from a Zionist conspiracy. I rather think you have missed the point, Andrew. Since your last post, I have been eagerly awaiting your comments upon this matter and I have not been disappointed. You have an uncanny ability to walk calmly through storms, with complete balance and afford the opportunity for folks on all sides to learn something. Stuart, you are a prince! And thanks for that excellent page listing each and every site covering the story. A really valuable resource (I just left a note on your page). Please do remind my readers again of its URL, so readers here can access it. We wish to show our solidarity with Seismic Shock who has been the victim of intimidation for shining a spotlight on the anti-Zionist theology of Reverend Stephen Sizer. I see you added it. You are most kind. I have to agree with Stuart about how you manage to get to the crux of the matter in such style! Meanwhile, I wonder what the outcome of this will be? Oh, someone on my blog has said that the comment might not even be from Sizer! While it might be right to rebuke Sizer if he is in the wrong, I'm surprised you don't also rebuke Joseph Weissman, as an older, wiser criticism. Instead you seem to promote his writing by linking to his blog. I know you have a disclaimer, but still.... After all, he did do some pretty nasty things to Sizer, as recounted in the letter. I think it's these things that Sizer would have seen as harrassment, and which most reasonable people would also. From what I have seen of Sizer's blog he seems more than happy to engage in debate with people. SeismicShock went beyond that. Personal attacks are a sign of intellectual weakness, moral weakness, or a combination thereof. We should rebuke those who perpetrate them. But Stephen isn't happy to engage with people on his blog. He won't allow comments! "...You seem to promote his [Seismic'] writing by linking to his blog. I know you have a disclaimer, but still...."
You sound a little censorious yourself, Lee. For the record, I haven't rebuked anyone, simply commented on a story which relates to this blog's subject matter. Thank you for the link. The PS at the end of Sizer's letter kind of wrecked its whole tone, though, don't you think? Especially since now we know Seismic's IP address was in Leeds after all. An attempt to associate Seismic with the IDF? Or another PR miscalculation? Incidentally, Stephen Sizer deleted all comments from his own blog well over a year ago, largely in response to criticisms I made of him there concerning his sources and methodolody. He then has the chutzpah to accuse Zionists of trying to shut down debate! I am not though saying that Christians shouldn't meet in this way, it can be helpful in the right circumstances, I am simply saying that Christians need to be consistent in how and who we criticise, and for who they meet with. Conspiracy? It was a report in Haaretz - you know as well as I do that 'conspiracy' is a very loaded accusation to make, but how should we read that report in light of multiple bloggers attacking Sizer? Personally, I wouldn't call in the Police for verbal abuse because as a creationist I am verbally abused regularly (even by an Anglican minister) and it is counter productive as you say, but what of the question of feeling threatened? Sizer also has the opportunity to respond on his own blogs - and an appeal to the divine court is more powerful than human courts. It is God who vindicates the righteous in the end. I do wonder whether it was wise of me to ask Stephen Sizer to provide a foreward for my book in light of the attacks on him. But having looked into the evidence I can find no reason not to have done so - and am grateful. The many accusations against him are simply baseless as far as I can see. We need to be consistent and fair in how we judge. I have though expressed concern about political campaigns because they can be about human manipulation instead of working within the parameters of divine grace and speaking God's words into situations. Edit: Have I missed the point? If a blogger is sending material to a minister's congregation that could be seen as stalking or harrassment and perhaps a reason to call in the police, especially if such a person felt, rightly or wrongly, that campaign involved support from a foreign government. Am I censorious? Well, I do think you're wrong to link to Seismic Shock. Even with the caveat you provide. Seismic Shock ran a campaign of cyber-stalking against Sizer. That is wrong, sinful if you like. So yes, I do think you should seriously consider whether you blogroll Seismic Shock, and I do think you should have rebuked him in your post. As a Bible-teacher to a fellow-Christian, isn't that what you should be doing? I don't know if you know him personally, but if you do, you should probably have a word with him about some of what he's been involved in. Young people need to be counselled as well as indulged. Sizer debates by writing on his blog. People can criticise what he says on their own blogs, as you do yourself. That's to be applauded. What is not on is harrassment. Tell me, do you think that, based on what you know, Seismic Shock's actions constituted harrassment? Re the link, I don't know exactly where the idea came from. I do know that Seismic Shock has used multiple identities, so perhaps that explains it. "The many accusations against him are simply baseless as far as I can see." Are you seriously saying that the accusations of Sizer circulating material written by antisemites, and of using antisemitic sources and motifs, are baseless, in spite of all the evidence? In that case can you please refute my case against Stephen Sizer at http://engageonline.wordpress.com/2009/03/21/if-i-was-stephen-sizer-christian-antizionist-james-mendelsohn/ ? Have you actually looked at what I have written and the evidence I have linked to? Rev Sizer couldn't refute any of my charges except one (and a minor one at that). I'm just thankful he didn't set the police on me. James, the link in your article to the Dershowitz paper is broken. Is it somewhere else now? Did it make it through the peer review process? Sorry Freddie - the link certainly used to work! I think that Dr. Calvin's review of the situation that is happening is a very fair and just one. I do not know every single detail on this whole issue but i do know that the more i look into it and read about Sizer’s views and, more importantly, his way of expressing them I believe that it is only fair that he should get this response which, as Calvin says is 'breaking across the blogosphere'. If someone wishes to state their views publicly, they must understand that they will be challenged by people with opposing views. The fact that Sizer closed his comments section on his blogs and now threatens, and alerts the authorities about anyone who references him with disagreements and facts on his public activities proves that he cannot handle being opposed. I am all for peacemaking and doing anything to stop divisions within Christianity, but the fact that someone expresses their views on the internet and gets 'cautioned' as Sizer seems to believe, proves that free speech has gone out the window even though he may say whatever he wants about the State of Israel and Zionists. I just pray that he sees his wrong doing in this whole matter. Gabi, if Sizer has misbehaved then we should rebuke him too. But have you looked into some of the things that Seismic Shock has been doind and saying? They are really quite poisonous. An even take on this case surely has to include a condemnation of that? On the issue of closing the comments on his blog, many people do this when the volume of abusive comments becomes too much to bear. For example, on the BBC's post relating to this incident, they have also closed the comments, presumably because some of the vitriol that you can see on other sites was making its way here. James - the logic of your argument against Stephen Sizer seems to be as follows. I would suggest such logic is deeply flawed. There is no reason to question the holocaust, but as you know holocaust denial is a criminal offence in some countries, even honest research is forbidden. It seems to me the desire to implicate Stephen Sizer in holocaust denial is an attempt to silence him. Not associated with any UK Anglican evangelical groups by any chance are you Andrew? I rather think, Lee, you’ve overestimated my ecclesial authority. I’m not a pastor and have no spiritual oversight over Joseph Weissman (who I’ve never met) or anyone else. Also, don’t you think it’s a tiny bit rich opining who I may link to on my blog, then fully expecting your own comments to be published? With respect, you appear to have missed what this story is all about – an attempt to silence critics – and thus here you are suggesting the same. Concerning your comment about what is “sinful”, why limit this to Seismic? After all, some might argue Sizer's sharing a platform with Azzam Tamimi (who condones suicide bombings) next month is not in keeping with “Blessed are the peacemakers”. Which brings me to the main point. I do think we are getting off track here. If people really want to broaden this, I am very happy to prepare a detailed, impeccably sourced paper exploring Sizer’s theology and the manner in which (and where) it has been expressed. Otherwise, we need to stay focused on why this story erupted and was propelled throughout the blogosphere by both Christians and non-Christians, left and right, and pro- and anti- Zionists alike. It concerns a churchman’s right to express views however he chooses, and the right of his critics to do likewise. Yet instead the police were called in and another blogger threatened. Either we believe in free speech, or only when it is convenient to our views. Which is it? I'm sorry Andrew but did you avtually read my piece? I didn't accuse Sizer of Holocaust denial, I did point out that he circulated material written by deniers. Do you think it is acceptable for a Christian minister to do that? What do you make of all the other points I raised? Like his allusions to a supposed "Jewish lobby" which cows American presidents? >Seismic Shock ran a campaign of cyber-stalking against Sizer. Can you back that up, Lee? If you can, I'll cover it - but as I see it the main issue here is harrassment law being used to respond to critical articles, and the police to entertain the complaint. I've seen nothing of "stalking" by Seismic, whether it be phone calls, poison pen letters or anything else. Once again, if you have evidence, I'll cover it at my site (link on the name) and at the Online Journalism Blog at www.onlinejournalismblog.com. Calvin, please feel absolutely free not to publish any of the posts I make. It's your blog and your call. What I'm saying is that you should exercise that discretion more often. And so should both Joseph Weissman and living journey. In my opinion, that is. Don't you think that on purportedly Christian websites (both of them are meant to be) that I should expect to find material that is edifying rather than abusive? You may not be a pastor, and you may not know Mr Weissman, but as an older Christian surely your duty is not to encourage such antics? Don't you see how giving implicit backing only encourages those antics? At the same time, if Stephen Sizer does something sinful he should be rebuked. There are many ways of doing this, in private (if you know him) and then if he doesn't repent perhaps more publicly too. I don't know him, but judging from his affiliations, I'm sure he would agree with that. James - I have read Sizer's books, and listened to some of his video messages on his blog and I simply don't see any evidence of what you say. There seems to be instead a concerted effort of mud raking against him based on various alleged 21st century 'thought crimes'. The New Testament warns against spreading slander and gossip and those involved in Christian ministry have a duty to honour one another, even if there is disagreement over theology. It seems that the claims against Sizer are made to restrict free speech - a bit like Orwell's 1984 where 'Newspeak' and 'doublethink' mean words are banned until people cannot even protest against their slavery. Orwell was apparently concnered about the rise of fascism in Britain, but Jews themselves are in danger from fascism. In light of 'Newspeak' I do not feel at liberty to discuss the existence or otherwise of a Jewish lobby. I've also read his books and articles and have found the antisemitic insinuation of Israeli complicity in 9/11, allusions to antisemitic writers such as Norman Finkelstein, Lenni Brenner & Uri Davis, the antisemitic trope of a powerful Jewish lobby influencing US foreign policy, the antisemitic claim that European Zionists collaborated with the Nazis, and comparisons of Israeli policy with that of the Nazis. If you think me pointing this out is "slander and gossip" please tell me why. Firstly, I haven't seen any of this. But secondly, you pre-judge and suggest that, even if true, it is all antisemitic, knowing that the charge of antisemitism against a Christian minister is a serious one and the same as racism. You don't realise that what you are doing is creating a climate of fear and intimidation where honest debate is impossible. When honest debate is silenced in this way then you create the conditions for fear and intimidation to spread with arguments forced underground. You say you are are a Messianic Jew - perhaps you would do well to study the writing of Rabbi Paul in the New Testament about being loving and respectful to elders etc and working for peace and love between Jews and Gentiles as I have tried to do in my own books. Lee, you surprise me! Alluding to Matthew 18:15 (“If your brother sins against you, tell him his fault in private…) you suggest I rebuke Sizer privately. But I respectfully suggest your exegesis is quite flawed. From day one Sizer chose to criticize his fellow Christians quite publicly (rather than win them over in private), his writings and activities are out in the public domain, and indeed he actively and publicly promotes his views, which inevitably means public scrutiny. Besides, I’m not rebuking him (for sinning against me personally or otherwise). I’m simply commenting on a very public issue. Your efforts to deflect the story from Sizer to me, implying I encourage abusive, non-edifying behaviour by Seismic and Living Journey, is a tad weak (BTW, out of curiosity what are her “antics”?). My blogroll has a disclaimer. Did you notice I also link to The Independent, which includes the rather angry Israel critic Robert Fisk? Perhaps I’m encouraging him too? While naturally I’m flattered, you do rather seem to have overestimated a trifle the influence you think I have over people, which (somewhat wistfully) I feel I should correct. You do seem to be quite single-minded in your attempts to deflect any criticism from Sizer, failing to concede any error of judgment (“while it might be right to rebuke Sizer if he is wrong”, or “if Sizer does something sinful”). So I have two questions for you. First, do you know Sizer, and if so in what capacity And secondly, given how you strongly disagree with Seismic’s methods (and thus presumably his past anonymity), please will you let us know who you are exactly? After all, you know who I am and what I do, so why not reciprocate? In the meantime (and do please forgive me for seeking rather irritatingly to get back to the main issue), this post was about silencing criticism. Yet here you are a third time trying to do just that. Therefore, may I suggest if you have issues with Seismic and Living Journey, why not post your comments on their sites? As far as I know they’re not censorious, so I’m sure they’d welcome them, which is somewhat ironic given your efforts to have them silenced here. I didn't mean to suggest the Vee herself engaged in antics, rather that some of the comments on some of her posts, not made by her, were unedifying. Apologies for the misunderstanding. In answer to your direct questions, I have never met, nor do I know, Stephen Sizer. Nor have I been to his church or listened to him speak. Second, the reason I won't reveal my identity is because last time I did it I was on the end of nasty comments from a number of blogs from a number of people involved in this debacle. Yes, perhaps I have an interest, and perhaps it's affecting my judgment but I hope not. I think the key issue you raised was of how Christians seek to engage in public debate. We have not presented a pretty spectacle this time. We have not honoured God. We should all of us examine ourselves (me, Sizer, and everyone else) and repent where we have gone wrong. We should encourage each other to do good deeds and rebuke with gentleness where appropriate. In this spirit, I would encourage you to continue to engage those you disagree with in the gentle manner that you usually do. Though, and you may continue to disagree with me, I think you should not lend support to Mr Weissman. It's not about silencing him, rather about encouraging him as a Christian to be more Christlike. (I haven't read much of Sizer - same goes for him if he's done wrong, but I'm afraid I have to use ifs because I don't know myself. Calvin, on reflection, I think perhaps that I should not have got involved in this. You are right that it's not fair for me to be anonymous, whatever my reasons, and to make criticisms. For clarity, I have not meant to accuse you of bad faith. I admit that I am frustrated by Seismic Shock, and you know my views by now. I have not wanted to 'silence' him, really. Mind you, his behaviour towards the youth group at Virginia Water seems more than just fair criticism. I'm aware that I may have come across as somewhat holier-than-thou, and I'm sorry about that, too. It wasn't my intention. I'm going to try to forget about this whole thing and concentrate on doing some work instead! Lee, thank you for your gracious comment. While it helps to know who I’m talking to, please don’t leave over the anonymity issue. As long as debate remains respectful and objective here I will do my best to ensure no one feels harassed. Again, my blogroll is not an endorsement of anyone. But let me say this. Over time I’ve come to know of the acute crises of identity and theology young Messianic Jews (MJs) experience. Many orthodox Jews no longer view them as Jewish, secular Jews sometimes view them with curiosity, even suspicion, while as believers in Jesus they’re confronted with juggling their Christian and Jewish identities. 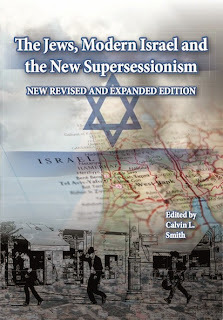 This is complicated by one group of Gentile Christians who smother and raise them on a pedestal (when, in fact, in Christ there is no qualitative difference between Jew and Gentile), while another so criticizes Israel and sides slavishly with Palestinian nationalism, it evokes painful memories of the Church’s shameful historical dealings with the Jewish people. Thus, many MJs face considerable criticism from their Jewish countrymen for continuing to identify themselves with Jesus. So when Stephen Sizer sets about a campaign of criticizing Israel, seeking disinvestment, speaking at Palestinian events, and criticisng Christian Zionists, all in the name of Christianity, some young MJs become frustrated, even angry. Concerning their methods, they are not infallible (nor are any of us, least of all me), and they must give an account of their own actions if they have done wrong. But just as people have raised the issue of context concerning why this story first erupted, context is important here too. So I agree this hasn’t been our finest hour. Yet the public manner in which a lot of this was kicked off in the first place could have been avoided, while the language of polarization also ought to have been eschewed. It is unfortunate, because a respectful and biblically-based debate over the Church’s response to Israel is much needed, leading both sides to modify their theology. I sincerely believe God retains a place in his heart for the Jewish people. But through the Hagaric covenant the Arab people are also special to God(I speak merely as an adopted Gentile). But sadly much of this is lost in the deliberately polarizing language and unwise methods employed by some, and Sizer must accept his share of responsibility for this. Though it is unpleasant in some quarters, I shouldn’t worry too much about the current row, as it will pass in time. Besides, the apostle Paul very publicly rebuked on several occasions, and we must take care not allow that British Christian disease of wanting to avoid conflict cloud our judgment. Views expressed robustly must be prepared to have those views equally robustly challenged. I do think something good will come out of all this. MJs are already being viewed and engaged with differently by their fellow Jews. I also think many Christians (on all sides) will think a little more carefully over how they express future views. Some have acted and said things – whether inflammatory language, intimidatory email campaigns, sticking up for one side right or wrong – which upon reflection they will concede was wrong and they will, in time, become better Christians. Finally, I am hopeful some fellow believers will eschew the language of polarization and shallow rhetoric instead of thoughtful, in-depth theology. After all, good hermeneutics would seem to suggest extreme positions are rarely biblically supported. Calvin, thanks for your careful response. I think I more or less agree with all you said, and was interested to learn something of your experience with MJs, which I'm somewhat ignorant of, I have to say. One final (and tangential) question: do you really think that Arabs are benificiaries of the Hagaric covenant? The reason I ask is that Arabs only entered Palestine and the Levant during the conquests after the rise of Islam. As such, I don't see that they can be the beneficiaries. What do you think? It is something I do want to explore further but as your comment indicates, it is very difficult tracing and discussing the ancient origins of an ethnic migratory group. 20: 11 And he [Abraham] gave to Ishmael and to his sons, and to the sons of Keturah, gifts, and sent them away (12) from Isaac his son, and he gave everything to Isaac his son. And Ishmael and his sons, and the sons of Keturah and their sons, went together and dwelt from Paran to the entering in of Babylon in (13) all the land which is towards the East facing the desert. And these mingled with each other, and their name was called Arabs, and Ishmaelites. Now I know Jubilees is not canonical. But this does help to push back a discussion of Arab origins some centuries before the migration you refer to. (Jubilees was written around 150-100 BC). What do you think? I think it comes down, as you said, to tracing ancient origins of the group. It's possible that today's Arabs are the self-same people. But it's also possible that the term 'Arab' is being used differently in Jubilees from how we use it today. That is, to refer to another group. Without knowing the exact facts, I can't do much more than set out the alternatives though. I'd be interested to see what you come up with, though!